“When I see the grin on people's faces at the top of the mountain, I know that I have chosen the right profession”, says Tommy Soleim, a skiing guide in Romsdalen. Four years ago, he and his wife started Romsdal Adventure, offering accommodation, food, summit tours and guiding. Around the dining table at the Villa Vengetind by the Isfjord in Rauma, many a cherished tour memory has been shared – usually accompanied by superlatives in both Norwegian and other languages. After a long day surrounded by fluffy white mountains and blue fjords, and the phone brimful of images that will reap heaps of likes, there is nothing better than to sit down with good food in good company – and of course get ready for tomorrow’s escapades. 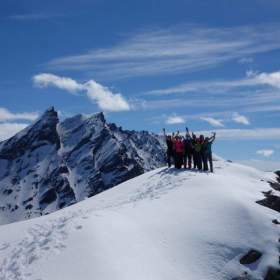 Outdoor enthusiasts love the Norwegian mountains, and more and more visitors choose to go on guided summit tours. Enjoy your trip! Just stay safe and remember that there is no shame in heading back home if needed. 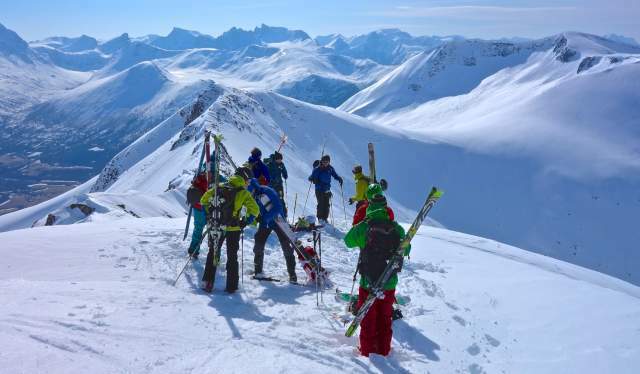 The tour guides know when the various summits in Romsdalen get busy. If you have a few days and want to avoid the queues, they can find the most suitable time to ensure the best experience for you. “When our guests stay for a week or more, we can plan ahead to avoid the crowds. For example, we know which mountains most people head to on Saturdays and Sundays in March and April, so it makes more sense to do those trips on a Monday, when we have the mountain almost to ourselves,” Tommy says. Tommy believes that value for money is the most important reason why more and more people choose to go on guided tours. “Guided tours are clearly on the increase, and they have become more highly regarded. Nowadays, people want to make sure that they spend their time well. If they are going to use a couple of days or a long weekend in the mountains, they want to leave with the best possible experiences. With a guide, there is a better chance of finding good snow conditions, and you get that extra peace of mind in regards to safety and avalanches. You can be sure to get the best possible trip available at the time of your stay,” Tommy concludes. Kristin Rydland Fjøsne has been on several mountain tours all over Norway. Last year, she and seven friends went from Nittedal to Romsdalen for the ultimate weekend trip. They were ready to rock in true Norwegian fashion. “We came by car, and followed the railway line from Dombås to Åndalsnes in beautiful surroundings. This train journey has been ranked among the best in the world by Lonely Planet. We wanted to conquer a couple of peaks before returning to everyday life eastern Norway”, Kristin explains. The keen girls stayed at Villa Vengetind, and went on hikes both with and without guide. “It was truly amazing to reach these peaks. We had an awesome view over the fjord, the sea and the swirling Rauma river. We were surrounded by a wreath of white peaks, but at the bottom of the fjord it was full spring, with grazing sheep and lamb on the green grass. At Blånebba we saw the Trollveggen cliff plunge down and the city of Molde by the ocean. These are some of the best tours I have ever made, because we got to see both fjords and the ocean. It's a great feeling to reach a mountain top, but nothing beats a sea view,” Kristin thinks. She has now bought randonnee skiing (alpine touring) equipment and is ready for a season of steeper heights and faster descents. 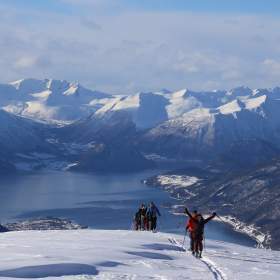 Romsdalen is not only snow-proof, the season is also unusually long. The alpine top tour season lasts from the middle of January to the first weekend in June. The season peaks towards the end of the period, with the Trollstigen plateau as the starting point for the Romsdal Adventure team. “We drive up Trollstigen, which is an experience in itself, park the car and put our skis. Here we are already over 800 metres above sea level, and have lots of high peaks to choose from. And since it is June, we can relax in sandals when we return from a trip. It’s a fantastic contrast”, Tommy says. The world’s best mountain runner has moved to Norway. Now, he’s trying to conquer his neighbourhood armed with nothing but skis and chocolate.